McALLEN — President Donald Trump sat at a U-shaped table in the Border Patrol station here earlier this month surrounded by mostly federal law enforcement, statewide politicians and the two Texas senators, who all helped Trump make his case for building a wall on the southwest border. After 60 minutes, Sen. John Cornyn, R-TX, asked the president if he could speak for a second time. The first time, Cornyn talked about the vulnerabilities of the border. But the second time, Cornyn looked at a couple rows of people not sitting at the table, who received invitations to attend the discussion but not to speak with the president. “I just want to acknowledge all the local officials here — the mayors, the county judges, the others — who support these men and women who wear the green and blue uniforms, and who basically end up trying to manage this humanitarian crisis that’s flood across the border because of the gaps in our law that you’ve already described,” Cornyn said. McAllen Mayor Jim Darling, Pharr Mayor Dr. Ambrosio Hernandez, Sister Norma Pimentel and other locals were on hand. “I wonder, if you wouldn’t mind, if we asked them to stand and we could recognize them and thank them for what they’re doing,” Cornyn said. The locals stood up and the room applauded. Therein lies Cornyn’s conundrum, according to some of his friends in South Texas: supporting his party’s president while also listening to locals in the Rio Grande Valley, many of whom disagree with Trump’s stance on a border wall. In hopes of keeping the conversation local, after Trump toured the McAllen area earlier this month, Cornyn hosted mayors, county judges and other local officials from across the region for a roundtable, which Sen. Ted Cruz, R-TX, also attended. Cornyn took what he learned from that roundtable to the Senate floor in the Capitol this week. 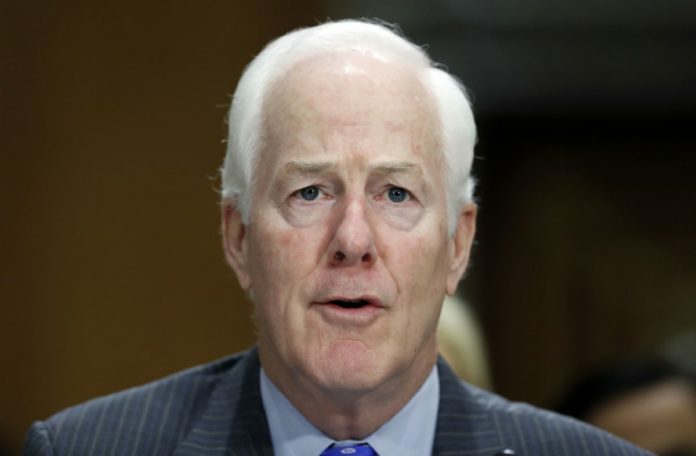 “I think those wise words ought to guide us in our discussions going forward,” Cornyn said. The government had been shut down for 35 days over border wall funding that Congressional Democrats refused to vote for. On Friday, Trump caved to U.S. House Speaker Nancy Pelosi, D-Calif, and Congress voted on a temporary spending bill that did not include any wall funding, which Trump signed. But the debate over a border wall is not expected to end, and Cornyn will likely continue consulting his friends and officials in South Texas. “Listening to the debate in Washington on border security, for example, I think there are a lot of people who frankly don’t understand the complexity but also the benefit that the border region brings to the rest of the country,” Cornyn said in an interview after an event he held in Harlingen this week. Cornyn has emphasized bringing Senate colleagues to the Valley over the years, in hopes of helping them understand the nuances of the region. But the debate in Washington has mostly ignored those nuances, which Cornyn acknowledged this week has been tough for him. Cornyn’s friends have noticed that, too. Villarreal noted Cornyn may be a bit frustrated trying to maneuver a compromise around an issue that he understands but few of his colleagues do. Not to mention Trump. But Cornyn’s approach is not one for show, as the president may prefer. McAllen Mayor Jim Darling, who has also known Cornyn for years, also noticed the senator’s unique position. During his two-and-a-half terms in office, Cornyn has visited the Valley more than any of his colleagues and has established friendships with many people in South Texas, Darling said. “I, for one, would rather listen to the experts,” Cornyn said after meeting with the local officials after Trump left town. But will Cornyn’s colleagues do the same?